Globe Telecom extends Free Facebook offer available to over 38 million subscribers until April 24, 2014, allowing access to the top social networking site with no data charges. "Due to the overwhelming response from our subscribers, we are happy to extend Globe Free Facebook until April 24, just in time for the summer season, to allow more users to enjoy an innovative, seamless, and worry-free Free Facebook experience. As the country's leading digital brand and preferred partner of technology leaders around the world, we hope to get more Filipinos online on their mobile devices and be part of a wonderful, connected world," shared Jenny Granada-Echevarria, Vice President for Mobile Data Services at Globe Telecom. The said promo was recently showcased at the Mobile World Congress in Barcelona, Spain by Facebook founder and CEO Mark Zuckerberg in his keynote. Zuckerberg cited the partnership with Globe in connecting more Filipinos to the Internet, as he shared his vision of a connected world through his pioneering project Internet.org launched last year. The collaboration between Globe and Facebook paved the way for all Globe prepaid, postpaid, and TM customers to enjoy free access to the social networking site alongside customer experience innovations that address the fear of mobile browsing. Among these customer experience innovations include accessibility on feature phones and smartphones* across all Facebook mobile platforms whether via the Facebook app or Facebook's mobile site m.facebook.com. Customers are also guaranteed of no billshock or "nakaw load" as they will be notified if they will incur data charges once a link that leads out of Facebook is clicked. For a seamless experience, subscribers can also enjoy a one-click registration to the data plan of choice to continue browsing sites or links outside Facebook without having to leave the site. In the spirit of customization, recommended data plans consider a subscriber's available prepaid balance and/or megabytes (MB) balance of existing data plan. Finally, customers with not enough prepaid load can "loan" a 10MB data plan for only P10 which will be deducted on their succeeding top-up so they can fully explore content outside Facebook. 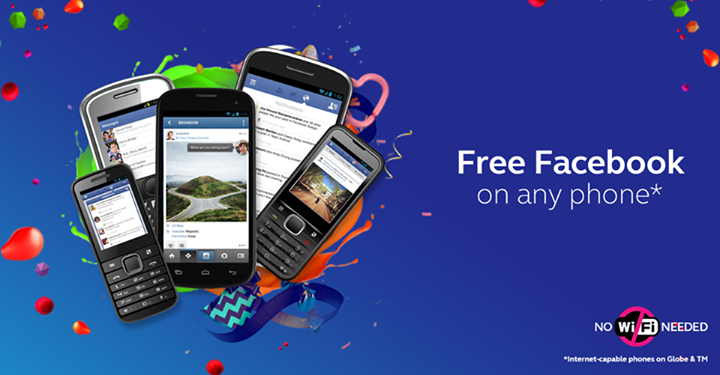 Subscribers can dial *143# and select FREE FB or text FREEFB to 8888 to get more. Subscribers may also go to m.facebook.com/free on the phone's web browser or open the Facebook mobile app while on the Globe network to access Free Facebook.